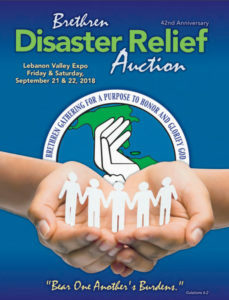 Our annual family-friendly benefit auction raises money to support the work of Brethren Disaster Ministries – serving in clean-up and rebuilding projects around the US and worldwide. You can make an impact by getting involved! We are followers of Christ, and volunteer from 122 Church of the Brethren congregations coming together annually to offer you a fun fundraiser auction event. We welcome you to be part of this year’s auction, which will be the 42nd auction event. Whether you are a donor, a volunteer, or come to enjoy the food and fellowship, your support is greatly appreciated! Thank you for helping to Make our Auction a Success! Support Victims of Hurricane Florence and Double Your Gift!